Avocados are one of nature’s super-foods. They’re grown in New Zealand and they’re in season now, so there’s never been a better time to go green, writes Peta Stavelli. The Guinness Book of Records lists the avocado as the most nutritionally complete fruit in the world. Avocados are a super-food, providing vital nutrients for a healthy body. They contain mono-unsaturated fat which helps maintain healthy cholesterol levels. Avocados also contain essential Omega-3 fatty acids, together with around 20 vitamins, minerals and phytonutrients. Substituting avocado for the butter, margarine and other fats you might normally use on your sandwiches or toast can also help reduce your cholesterol intake. It is thought that New Zealand's first avocado was introduced to the Gisborne area by the late Charles Grey in about 1920. Mr Grey raised one cropping tree from seedling. The fruit was marketed in Auckland for the first time in 1939 and it as so well received, the Greys decided to import a number of varieties from California. Trials continued throughout the 1940s until around 20 varieties were established. Preheat oven to 180°C. Line an oven tray with baking paper. Place the chicken schnitzels on the lined tray. Lightly spray with oil spray. Bake in oven for 10-12 minutes or until chicken is golden brown and cooked through. Meanwhile, combine the avocado, tomato and coriander in a small bowl. Taste and season with salt and pepper. Spoon avocado salsa over the chicken schnitzel and serve immediately. If desired, add some chopped jalepeno chilli to the salsa for a fiery kick, or add a finely-chopped red capsicum for added crunch. 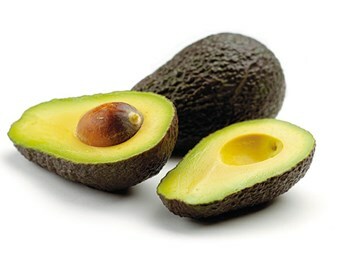 Cut avocado in half, remove seed, skin and cut flesh into chunks, drizzle with lemon juice and set aside. Bring a large pot of salted water to the boil and cook the pasta until just cooked. In a fry pan heat the olive oil and gently cook the onion, garlic and chilli until onion is transparent. Add the seafood and cook for one minute while stirring, add wine or stock and cook for a further two minutes. Stir in the pasta, avocado and parsley, season to taste. For extra spice, increase the amount of chilli. As an alternative, replace seafood with diced chicken.